1. TBF-1C, White 97 (BuNo 48102),was assigned to Torpedo Squadron 2 (VT-2) aboard the carrier USS HORNET (CV-12) during the summer of 1944. The VT-2 insignia was displayed on the forward fuselage, while the white disc on the vertical stabilizer identified the HORNET's Carrier Air Group 11 (CVG-11). This Squadron participated in the Battle of the Philippine Sea on 19-20 June. 2. TBF-1 (C-5) was assigned to Composite Squadron 30 (VC-30) aboard the light carrier USS MONTEREY (CVL-26) in the fall of 1943.The red-bordered national insignia was only authorized for use between 28 June 1943 and 31 July 1943; however, the change to the blue-bordered insignia was not complete until late in that year. 3. The first production Grumman TBF-1 Avenger was BuNo 00373, was delivered to the US NAVY (USN) in January of 1942. 4. 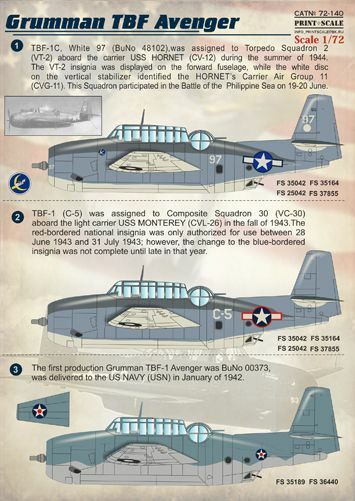 White 110 was a TBM-3 assigned to VT-82 adoard the USS BENNINGTON (CV-20) in February of 1945.The aircraft was overall Glossy Sea Blue FS 15042 , with Glossy Insignia Blue FS 15044 and Glossy Insignia White FS 17855 national markings. The white arrowhead on the rudder and the upper starboard and lower port ailerons was the BENNINGTON's air group insignia. In early 1945, VT-82's Avengers attacked enemy targets in Japanese home islands. 5. Lt (JG) George Bush- the future 41st President of the United States - flew this TBF-1C, while assigned to VT-51aboard the USS SAN JACINTO (CVL-30) in the western Pacific in the fall of 1944. He named the Avenger BARBARA for his fiancee, Barbara Pierce. Bush's aircraft was shot down while attacking the Japanese-held island of Chichi Jima on 2 September 1944. 6. This TBM-3S (Y-AR, 53682) was assigned to Number 880 Squadron (later VS-880), Royal Canadian Navy (RCN) at RCN Air Station Shearwater, Nova Scotia in 1952. The aircraft- locally designated the Avenger AS Mark 3-was used for anti-submarine patrols off Canada's Atlantic coast between 1950 and 1957. This Avenger retained the USN finish of overall Glossy Sea Blue. 7. Grumman TBM-3E2 Avenger, Royal Netherlands Marine Luchtvaart Dienst, s/n 071, VSQ-1 Valkenburd AB, ca 1959. 8. TBM-3, 89, of VC-94 onboard the USS Shamrock Bay, early 1945.The aircraft is painted Glossy Sea Blue overall and carries the Irish symbols of White Shamrock and Crossed Pipes on the rudder and thirty-five white mission markings under the cockpit on starboard side. 9. (Above) A Grumman TBF-1 of US Navy squadron VT-8- one of the aircraft lost in the Avenger's first operation, at Midway on 4 June 1942. (CVE-12) IN September of 1943.